The Teenybopper has started his team workouts. My laundry loads have now been doubled and tripled. Between my workouts and his workouts, we get a lot of stinky, sweaty clothes being thrown in our hampers. I’m not a fan of leaving them there, so I like to throw them in the wash and get them cleaned immediately. This is why I’m eyeing the LG TwinWash system. It actually lets you do two loads at once or just a small load when you need to get that stinky workout gear washed ASAP. You can add the LG SideKick pedestal washer to almost any LG front load washer. It will simply lift the front load washer to a more comfortable height and will match the LG Dryer’s pedestal. The 1.0 cu. ft. capacity is perfect for cleaning smaller loads quickly and easily. You know this techie loves the magnetic remote control which lets you start, stop, or select a cycle. You can place delicates, hand washables, and workout clothes in a separate washer so that they get the special care they deserve. The LG direct drive motor offers a 10-year warranty. 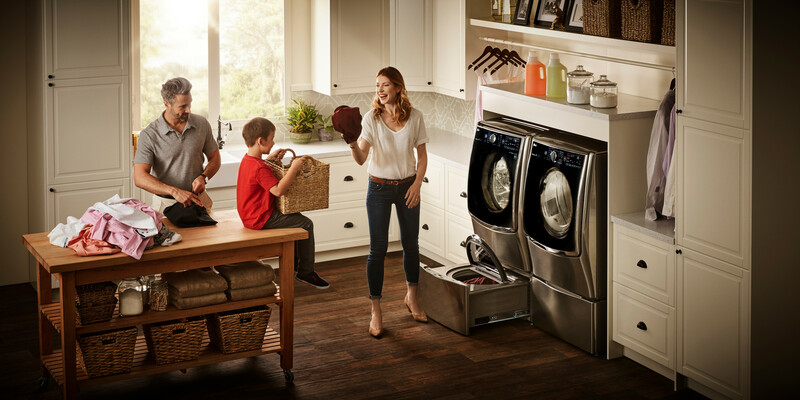 The best part is that from 1/11-4/25 you will receive up to $500 off a LG laundry solution for your home at BestBuy! I will recommend this to my sister, who is renovating her home currently! I would LOVE a washer drier set like this! Both of ours are old and falling apart; desperately needing replaced! Awesome review! You always recommend good products. LG should send you their washer for free! I’ve seen these on TV and they look awesome for people with kids. I don’t have a need for these but I’m sure there are many parents out there that have kids in soccer, baseball, and other sports that would love to have these in their homes. That is an informative review , will definitely recommend it to someone who is looking for one! Oh baseball season. Sigh. That is the season when we eat dinner in the car or at like 9pm every night. Anything that simplifies the life of a family with busy kids…sign me up!! This is an awesome design, but living in Denmark, where the washing machine is often in the kitchen or bathroom, I cannot get over the size of this machine! It would take up most of my kitchen… lol!